Marka has many fine woods and lakes, splendid vantage points, and trails and woodland roads good for trekking. Here you can walk or hike, cycle, ski in winter, swim, go fishing and pick berries. Or what about a picnic? There also are several small cabins where you can stay over night and Marka Lodges where you can buy a cup of coffee and something to eat. The roads in Marka are closed to traffic. But there are many carparks at the accesses to Marka from which you can start a tour. There are many ways to get to them on public transport. You can travel to Marka by Metro, bus, tram or train. In summer there’s boat service to the fjord islands. Ruter.no and Ruter App show how to get from A top B using public transport. For information on public transport in Oslo, you also may visit the Ruter Customer Service Centre at Jernbanetorget (at the Central Railway Station). 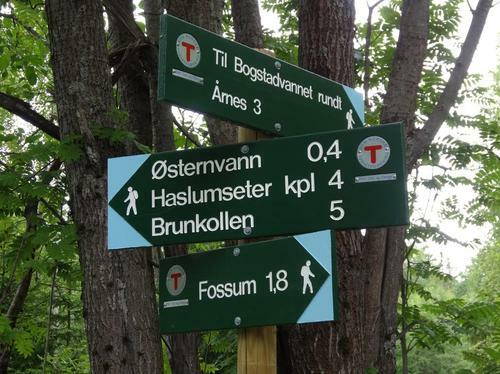 Hiking trails and paths are shown on the trekking map of Oslomarka. The most popular maps are “Oslo Nordmark” (summer and winter versions), “Oslo-Østmark” and “Oslo-Vestmark”. The Trekking Centre at Storgata 3 stocks trekking maps for all of Norway, as well as for Oslomarka. The maps are also sold online at the DNT web shop. There are good digital maps at UT.no and Ut App. But mobile phone coverage in Marka is uneven, so we recommend paper maps. You also can print out maps from UT.no. FISHING: You will need to buy a fishing licence if you wish to go fishing in the lakes of Oslomarka. You may buy a licence online at inatur.no or ofa.no. Saltwater fishing is free. You can follow the signs and blue blazes on trees in Oslomarka. With this waymarking you can easily and safely find your way on a hike. Follow the blue blazes for safe hiking. Red waymarking in Marka indicates a ski track that may go over marshes and lakes. So we recommend that you don’t follow red waymarking in summer. When uncertain, ask others. You most likely aren’t alone in Oslomarka and will meet others who can help you find the way. 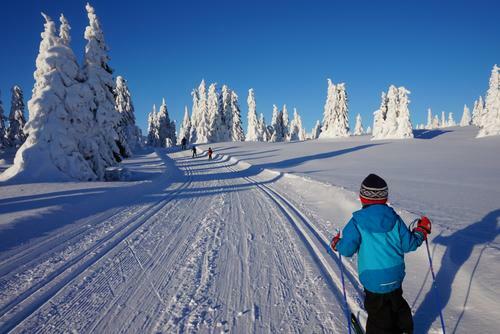 PUBLIC ACCESS TO LAND REGULATION: In Norway, by law everyone is entitled to enjoy the outdoors, regardless of who owns it. The relevant regulation applies to woods, the coast, and in the mountains, but not to private gardens or cultivated fields.